This version is customized for use in classrooms (no social media integrations with unlimited access to the Skill Builder and all content). 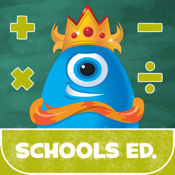 Math Champ Challenge (Common Core Standards) is the latest educational game from award winning INKids Education. It's designed to help strengthen understanding of Common Core mathematical standards for middle school students (grades 4-7). Math Champ Challenge includes over 2,500 questions across grades 4 to 7 covering all Common Core State Standards. During play questions are randomly selected from within each Standard (providing a balanced mix of content from all Domain Standards for each grade). Every game is different, but will always include a suitable mix of content comparable from game to game (and player to player). At the end of each level, revision is encouraged and players can practice any “Cluster” or questions and then re-take each challenge (each grade contains 5 levels from EASY through to SUPER NERD / MASTERY). Using the Math Champ Challenge Skill Builder, students are able to answer practice questions in a non-game version of Math Champ. Players can select specific subject areas (aligned with each Common Core Domain) and work through questions at their own pace . The skill builder allows students to answer both open ended and multiple choice (self-marking) questions while also gathering XP points. The skill builder provides a PLE (Personal Learning Environment) to help students build confidence as they strengthen their understandings of mathematical subjects. The adaptive engine will move advanced students towards mastery, while students who might be struggling with particular areas will be served less challenging questions. This brilliant feature means that all students can work at their own pace (also allowing parents or teachers to provide instructional support where required). In Math Champ Challenge, players can compete on the same device or by using Game Center to compete with players all over the world (If your school doesn’t allow GC access, scores for individual players can still be record on the same iPad). Math Champ Challenge is the only math game of it’s kind - each player's performance is recorded across all Common Core Standards, allowing players to earn achievements and badges for each Domain "Cluster" meaning that it can used as valuable assessment tool in the classroom, or at home as a fun way to practice for exams. Achievement badges are directly aligned with CCSSI Domains and are awarded at the end of each grade (when all levels have been completed). Badges are awarded when a player has demonstrated better than 90% accuracy across all difficulty levels, and various other achievements can be earned during play. Badges, Achievements and other Game Center rewards, means that Math Champ Challenge will engage all types of students. This app provides valuable feedback for teachers and parents and and is designed to engage and encourage students as they have fun while learning everything from fractions to geometry and arithmetic. We suggest using Math Champ Challenge as tool to enrich traditional lessons. It can be used effectively alongside other, apps and instructional resources like the Khan Academy. If you are experiencing any problems, please contact us via the email button on the top of our support page.